Offa Robbery: Police invites Saraki, gives reasons – Royal Times of Nigeria. The Nigeria Police Force has invited Senate President, Senator Bukola Saraki to report at the Force Intelligence Response Team office at Guzape, Abuja to answer allegations against him by some of the suspects in the Offa robbery, The Nation reports. According to the Police, the suspects allegedly confessed during investigation that they are political thugs under the name Youth Liberation Movement a.k.a “Good Boys”. They also allegedly admitted and confessed to have been sponsored with firearms, money and operational vehicles by the Senate President, Sen. Bukola Saraki and the Governor of Kwara State, Alh. Abdulfatah Ahmed. The suspect went for the robbery in Offa with an operational vehicle with a car sticker in shape of number plate that had the inscription; ‘SARAKI’. 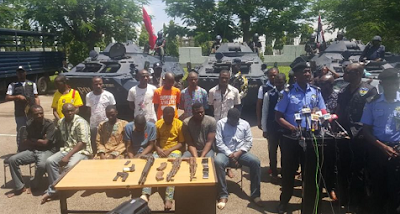 Giving an update of the investigation during their parade in Abuja on Sunday, the Force Spokesman said 22 suspects have so far being arrested for their alleged involvement in the robbery attack which left 33 persons dead, including nine policemen and some pregnant women. 13 of them were however paraded while the remaining were said to be out with the Police for further investigation. The gang members who allegedly indicted the Senate President are; Ayoade Akinnibosun, Ibukunle Ogunleye, Adeola Abraham, Salawudeen Azeez and Niyi Ogundiran. Ogunleye confessed to killing two persons, Abraham killed five persons, Azeez killed two persons, and Ogundiran killed two persons during the robbery. Other suspects arrested are; The PA Political to the Governor of Kwara State, Alabi Olalekan and the Chief of Staff to the Governor of Kwara State, Yusuf Abdulwahab. On the invitation of the Saraki, the Force Spokesman, ACP Jimoh Moshood, said: “Senate President, Sen. Bukola Saraki is being invited to report to the Police to answer allegations indicting him from confessions of Five gang leaders arrested for active participation in Offa Bank Robbery and Killings of 33 innocent persons.